Talking with some fans, Riker himself, Jonathan Frakes, who also took a turn in the director’s chair for an episode of Star Trek: Discovery, shared an interesting tidbit about the upcoming series. The revelation comes from a stop on The Continuing Voyage convention tour in Chicago, during a Star Trek: The Next Generation reunion panel. According to Five Year Mission, a Trekkie band that was in the audience at the time, Frakes shared that Discovery will be going to the Mirror Universe. The news was later confirmed by Star Trek fan site Trek Movie, which talked to the band and other members of the audience. Notably, Frakes didn’t say that the episode he directed is the one that goes to the Mirror Universe, nor did he offer any other information on the episode. But he did say that he has seen the series pilot and called it “amazing,” and that fan dread is unfounded. If Frakes is correct, this will be the fourth Star Trek series to visit the Mirror Universe; joining Original Series, Deep Space Nine, and Enterprise. Notably, if the protagonists of Discovery themselves journey into the Mirror Universe, they will be the first such entrants in the entire timeline—Enterprise simply featured two episodes set in the universe, and didn’t have any of the crew cross over into it. While the Mirror Universe is justifiably beloved, this could be an instance of the new series leaning too heavily on nostalgia. 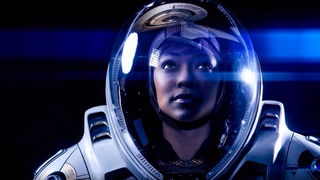 With a story set so close to the Original Series, leaning on aesthetics similar to the Abrams reboots, Discovery is going to have to work hard to step into its own identity. In more Discovery news, CBS shared a new brief teaser on the show’s Twitter. You can see that below, and the series will begin airing in just a week, on Sunday, September 24th, on the CBS All Access streaming platform.